We have known for years that this image is entirely wrong. Chimpanzees, often cast at the base of the sequence, are – wow – just as evolved as we are. After all, they are an extant species, living today, and have also gone through millions of years of evolution since our common ancestor. 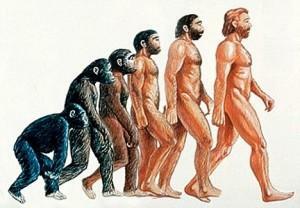 The sequence of being hunched over as a shuffling apeman in the middle to an erect man at the end is also wrong. Bipedality came early in hominin evolution, and is linked with an upright skeletal frame, not some missing link that mixes chimp and human into one. Finally, the linear sequence itself is wrong. There were numerous species of hominins in the past, a veritable branching tree just like Darwin used to diagram. Shea adds one more important element that helps to completely dismantle this popular image. We often assume that our immediate ancestors were primitive, and that something special must set us apart. Shea’s article, Refuting a Myth about Human Evolution, is this month’s feature article in American Scientist. For decades, archeologists have believed that modern behaviors emerged among Homo sapiens tens of thousands of years after our species first evolved. Archaeologists disagreed over whether this process was gradual or swift, but they assumed that Homo sapiens once lived who were very different from us. These people were not “behaviorally modern,” meaning they did not routinely use art, symbols and rituals; they did not systematically collect small animals, fish, shellfish and other difficult-to-procure foods; they did not use complex technologies: Traps, nets, projectile weapons and watercraft were unknown to them. This view is wrong. Much of the evidence used to support this view has relied on stone tool technologies, which are one of the most accessible records we have of human activity in the past, and the presumed florescence of art and sophisticated tool making in Europe by cro-Magnons, contrasted with those nasty, primitive Neanderthals. In Europe, the oldest Homo sapiens fossils date to only 35,000 years ago. But studies of genetic variation among living humans suggest that our species emerged in Africa as long as 200,000 years ago. Scientists have recovered Homo sapiens fossils in contexts dating to 165,000 to 195,000 years ago in Ethiopia’s Lower Omo Valley and Middle Awash Valley. Evidence is clear that early humans dispersed out of Africa to southern Asia before 40,000 years ago. Similar modern-looking human fossils found in the Skhul and Qafzeh caves in Israel date to 80,000 to 120,000 years ago. Homo sapiens fossils dating to 100,000 years ago have been recovered from Zhiren Cave in China. In Australia, evidence for a human presence dates to at least 42,000 years ago. Second, the stone tool evidence shows great variability and overlap in tool types over this time period, rather than some march to modernity. When [Clark's model of five modes of technology] is applied to sites in eastern Africa dating 284,000 to 6,000 years ago, a more complex view of prehistoric life there emerges. One does not see a steady accumulation of novel core technologies since our species first appeared or anything like a “revolution.” Instead one sees a persistent pattern of wide technological variability. But Shea’s real target is not simply the documentation of variation in fossils and tools in the past, it’s how we think about the past, and how we do research and test ideas about recent human evolution. Paleolithic archaeologists conceptualize the uniqueness of Homo sapiens in terms of “behavioral modernity,” a quality often conflated with behavioral variability. The former is qualitative, essentialist, and a historical artifact of the European origins of Paleolithic research. The latter is a quantitative, statistically variable property of all human behavior, not just that of Ice Age Europeans. As an analytical construct, behavioral modernity is deeply flawed at all epistemological levels. This paper outlines the shortcomings of behavioral modernity and instead proposes a research agenda focused on the strategic sources of human behavioral variability. Using data from later Middle Pleistocene archaeological sites in East Africa, this paper tests and falsifies the core assumption of the behavioral-modernity concept—the belief that there were significant differences in behavioral variability between the oldest H. sapiens and populations younger than 50 kya. It concludes that behavioral modernity and allied concepts have no further value to human origins research. Research focused on the strategic underpinnings of human behavioral variability will move Paleolithic archaeology closer to a more productive integration with other behavioral sciences. As Shea writes, the “behavioral modernity” approach focuses too much on the search for “human uniqueness”, and is framed by a narrative of moving from a primordial past to our resounding success as a species. In a typical heroic narrative, obstacles must be overcome, failures fought through, until finally here is a transformation in the hero – ourselves. That transformation is when we became “behaviorally modern” and language and art and all those good things are the trappings of our success. This narrative comes with significant limitations. The strongest reason for discarding “behavioral modernity” and “modern human behavior” is that they lack analytical precision. As matters stand today, there are wide and irresoluble theoretical disagreements about the nature of behavioral modernity, how to define it, and how to recognize it. Eurasian prehistorians use the term “modern human behavior” for evidence that occurs consistently over tens of thousands of years at a regional scale (various parts of Europe and/or Southwest Asia). Africanists use the term for behavior that occurs intermittently over hundreds of thousands of years at a continental scale. Neither term clarifies the description of archaeological evidence, nor does either of them refine our understanding of the evolution and variability of a particular behavior. They have become postmodern concepts, words that mean whatever one wants them to. The idea that behavioral modernity is a derived evolutionary state, one not shared by all morphologically modern-looking H. sapiens and one that can be reliably diagnosed from behavioral characteristics, is rich with potential for abuse. It fits well with racist arguments that there are meaningful grade-level evolutionary differences among living humans. Such views are rarely expressed in scientific circles (or polite company), but they nevertheless can find traction among nonscientific audiences because they incorporate the same unilinear model of human evolution that underlies the behavioral modernity concept. If paleoanthropologists judge humans’ evolutionary state based on their behavior, why shouldn’t others do so as well? Discarding the term “behavioral modernity” will not stop individuals from cherry-picking selected findings of paleoanthropology to support racist agendas, but it will deny them the illusion that they are emulating an accepted scientific method.